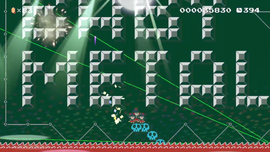 METAL RESISTANCE is an Event Course in Super Mario Maker, released on April 28, 2016. It unlocks the BABYMETAL Mystery Mushroom costume upon completion. The level begins with some coins, along with the first Pink Coin in a Brick Block enclosure, and must use a Big Koopa Troopa to collect it. The second Pink Coin is near a Big Goomba and a trampoline, and the final Pink Coin is up above, near a Big Wiggler and some Brick Blocks. Mario must then open the Key Door and make his way past some enemies before reaching a Checkpoint Flag and a warp pipe leading to an area with Big Thwomps and Burners. This follows with an area with Skewers and Koopa Troopas, along with another Checkpoint Flag. Mario will then ride a Lava Lift to a P Switch, and must travel across more Skewers, reaching a segment with Fire Bars. A Super Star in a ? Block can be found, along with Bowser, followed by a beanstalk leading to another warp pipe. Mario must then travel across some Flimsy Lifts to the Goal Pole. This page was last edited on October 7, 2018, at 17:29.